Today I am veering away from my typical local restaurant reviews to review a lawn care/on demand lawn mowing company that really blew me away this past weekend. This is a copy of the original review I posted on Angie’s List. If you are looking for a new, exciting, and reliable lawn care company, and trust me there are few in this area, look no further. LawnLeaders in a nutshell is Uber BUT for lawn mowing! Seriously.. it’s that easy. Visit their website and in 60 seconds you book your lawn job, schedule it, and pay all within the same form!! You even receive text confirmation afterwards! The best part is this is on demand and there is NO contract! This company really intrigued me and had me talking about it all week to my co workers because this is something you usually see out in San Francisco or somewhere more innovative not a small town like West Chester but I absolutely LOVE the convenience and ‘on demand’ aspect. Sometimes I randomly need lawn mowing done ASAP and this is clearly my new solution. I love how this company is disrupting a service industry that is usually slow, unreliable, and overpriced. LawnLeader’s lawn mowing prices and services are per hour and very affordable. Their professionals are insured, certified, and reliable. I even had to reschedule my initial appointment because I had a last minute dentist emergency so I called their support number which apparently is their CEO’s DIRECT LINE! Their customer support is seriously on point and I will be using them all summer season. Seriously, it takes a lot for me to actually find a new, exciting, and innovative company especially in a small town like West Chester but damn these guys are really making me optimistic about the West Chester Startup scene! Love it! 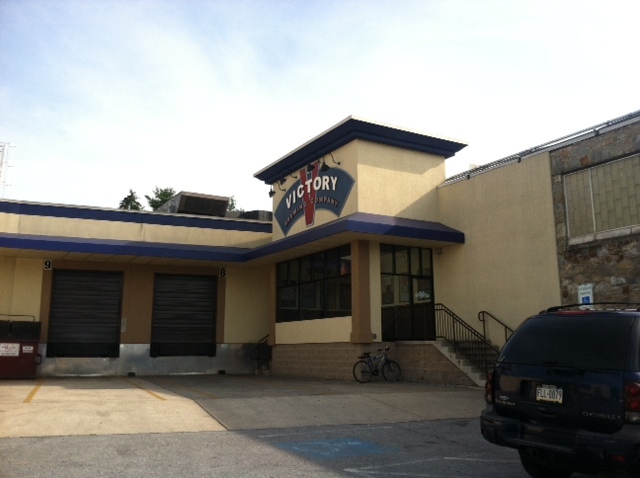 Conveniently located about 10 min outside of where I live, Victory Brewing has a Brewpub serving up quality sandwiches and entrees that pair well with all the beers they have on tap. Not sure what kind of beer to get- ask the server! They are very knowledgeable in the flavors and styles of each beer. Heads up dont expect any beer besides Victory, they do serve wine though. Love the beer and want to take it home, you can in one of their Growlers! The food was inexpensive, delicious and the portions were massive! Most of their menu items have a twist to them. 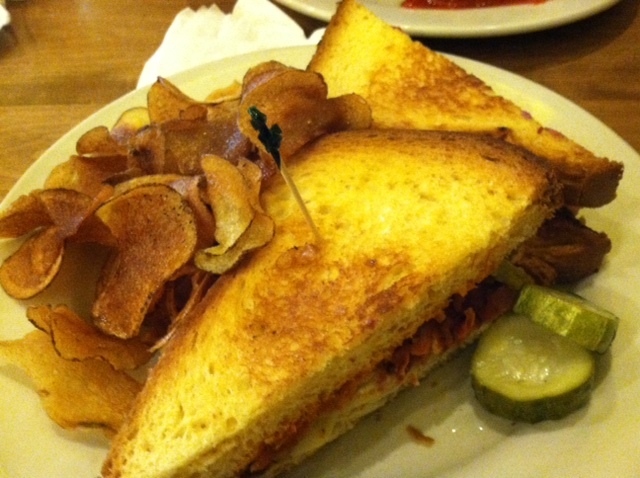 They serve up your typical home style favorites but put their own spin on it. They use local ingredients in their entrees and pizza. 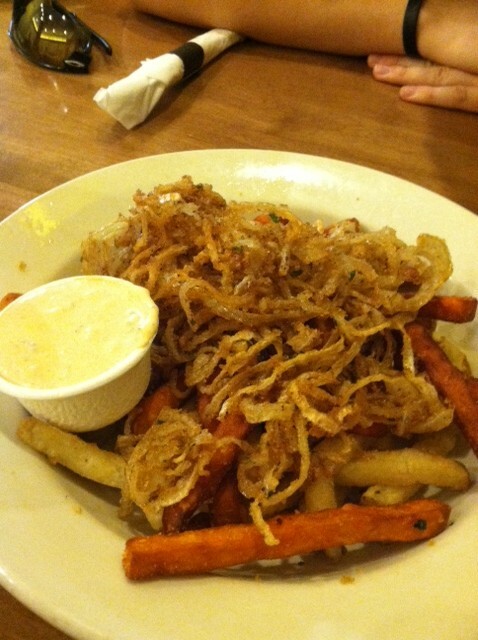 I started out with the fries as an appetizer. It included three types of fries with a chiptole mayo dipping sauce. Two thumbs up from me! Next up I got ” The Diane” which had hickory smoked turkey, avocado aioli, white cheddar, roasted tomato spread, brioche! The smokey flavor from the meat tasted so well with the toasted bread. I added bacon to it for an extra 2 bucks! If you are ever in the Philadelphia region, check out these other breweries in the area! Question for you bloggers…What makes a pizza awesome? Is it the cheese? The dough? The sauce? The way its cooked? I wanna hear what you think! I spent my summers at the jersey shore working and would often eat ” Mac and Manco Pizza” now called ” Manco and Manco” for literally lunch and dinner. 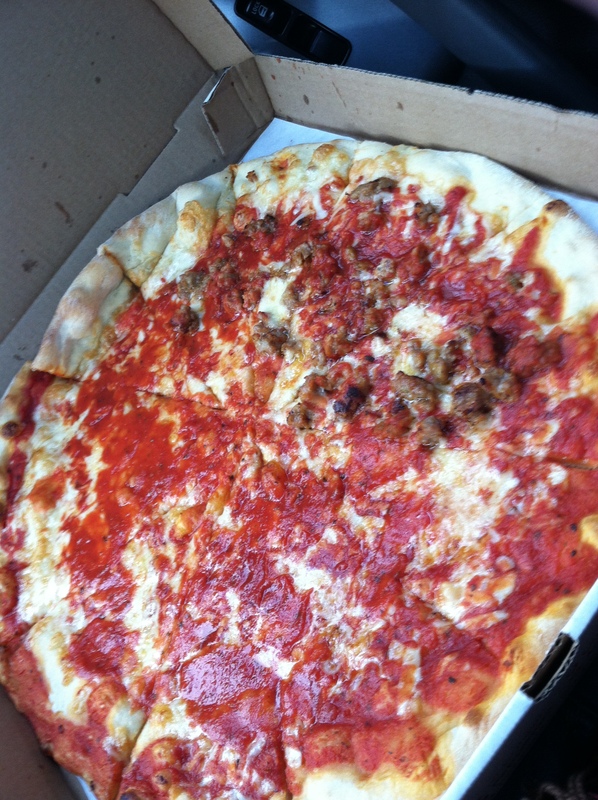 It was cheap, cooked evenly throughout the pie, the perfect amount of cheese and definitely a jersey shore tradition. 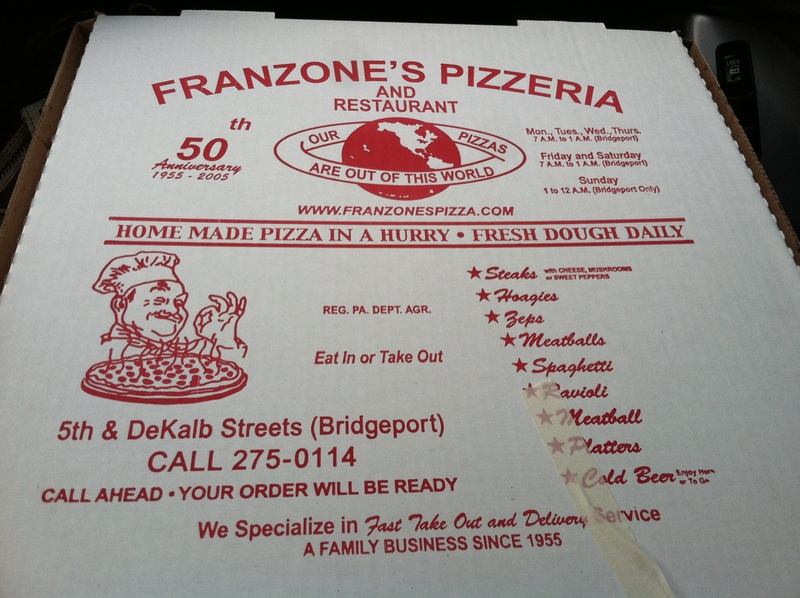 However, after summer was over I would find myself sad because there are not too many family owned, top quality little pizza shops in West Chester, PA… Until I drove 20 minutes, to a pizza shop called Franzone’s. Located in a small town called Bridgeport, 2 miles past King of Prussia, this place I definitely receives an A+ for the most unique tasting pizza I have had! 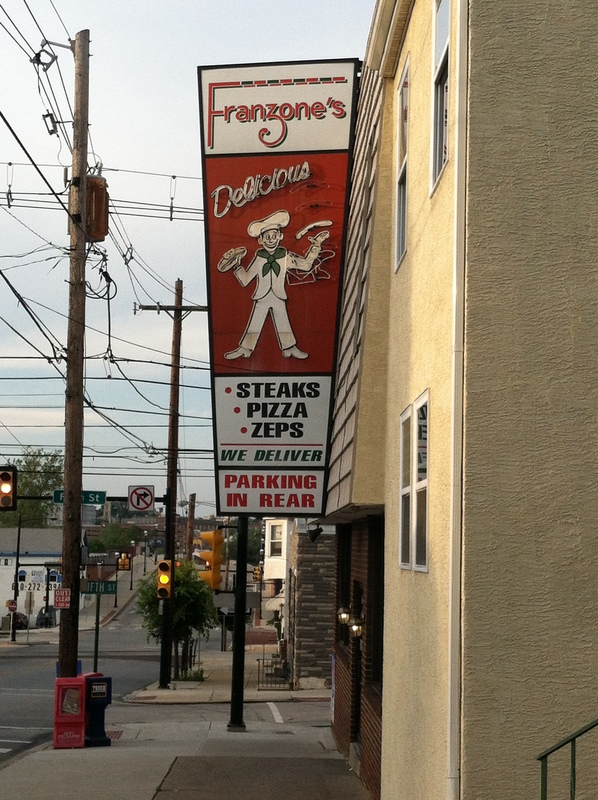 Franzones has a a dine in restaurant , take out beer and a pizza menu that will not disappoint. Philadelphia Magazine awarded Franzone’s “Best of Philly” and local sports radio voted this shop top ten for pizza in Philadelphia area. I now see why. Franzone’s makes their fresh dough daily, which you can watch them make it in the window. The sauce is sweet which I have had nothing like it before- that is the secret. There is not too much sauce and its not thick and heavy, very smooth . There is a perfect amount of crust. They place the cheese down first then the sauce. I rarely eat more than one slice of pizza but when I had Frazones, I was able to eat 4, it was that good and addicting! The picture does not do it justice, you will just have to try it out for yourself if anytime you are in this small town! Nestled in the heart of Fishtown in Philadelphia, Frankford Hall is your go to place for simple, fast, quality German Cuisines. 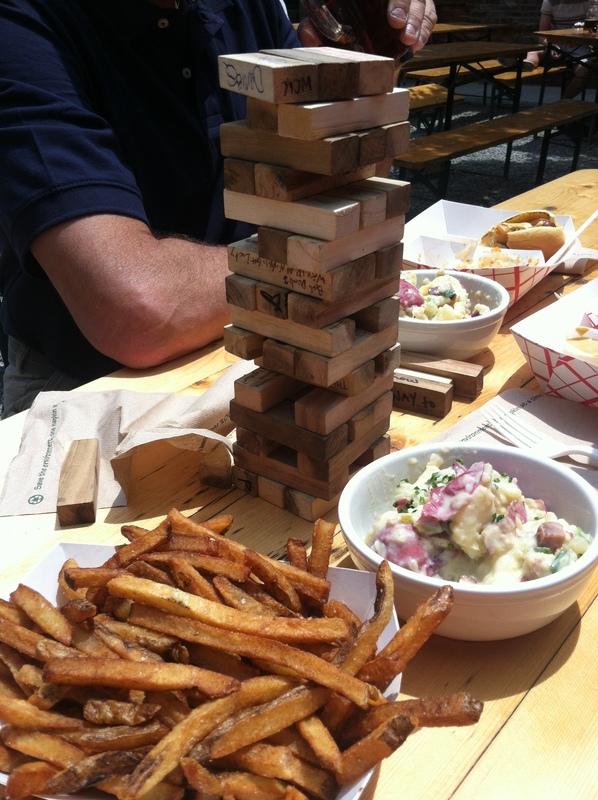 Choose to hang out inside with a group of friends playing Jenga at the table or relax outside in the beer garden! 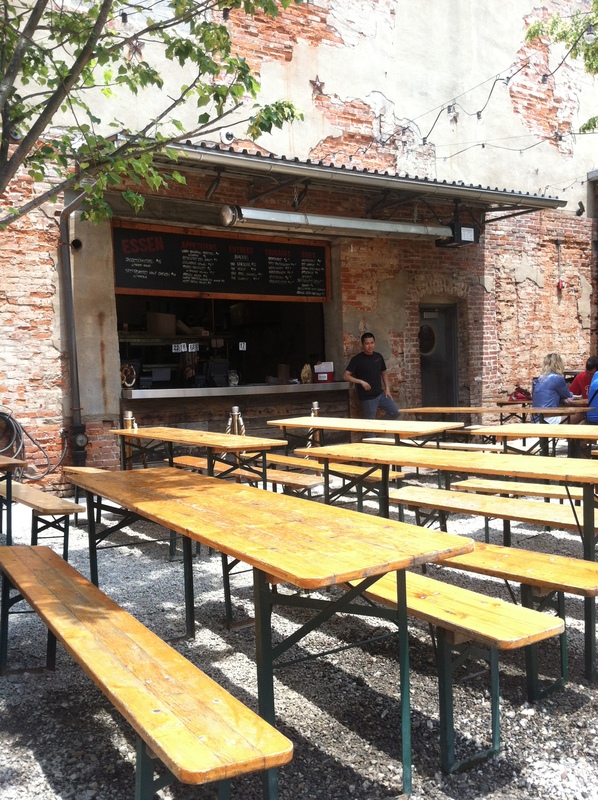 Frankford Hall is first come first serve with no reservations. Grab a seat while you see an open one! This Steven Starr establishment is set up like a fast food joint- you walk up to the counter to order your food. Its cheap, fast and no tipping is required. Don’t be fooled! Frankford Hall hands down and two thumbs up is the best German Food I have tasted ( along with my grandfathers of course). The menu is short and simple with your typical German Favorites: Warm Bavarian Pretzels, Sausages, Red Cabbage, German Potato Salad and Sauerkraut. 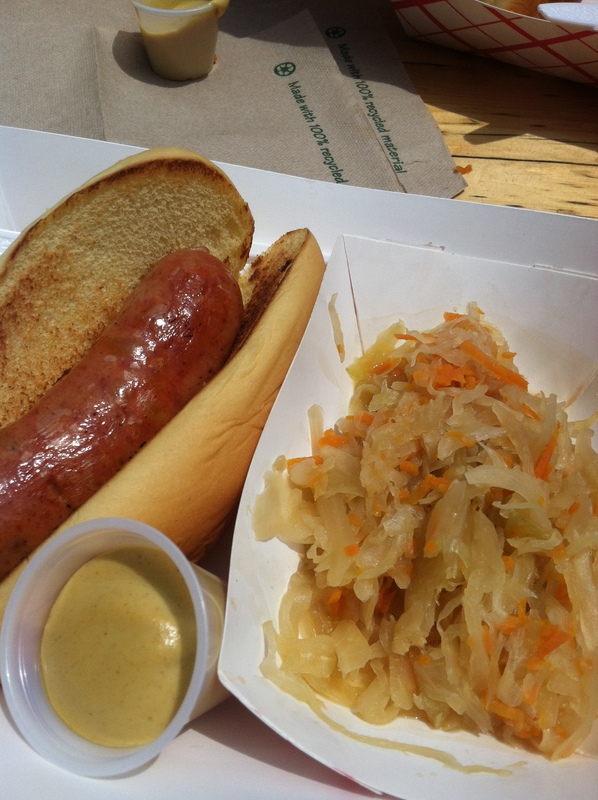 Frankford Hall really stresses the importance of flavor behind their homemade sausages. Its simply just a sausage link on a roll, with a side of Mustard. I had the Keisekrainer ( beef,pork,cheese). Trust me when I say no need to add a bunch of toppings. The cheese melted out of the sausage which paired so well with the toasted buttery roll. I would highly recommend this restaurant to anyone who is looking for something that is cheap and has a unique atmosphere! Bravo Steven Starr for allowing me to explore my German roots close to home at this one of a kind restaurant!